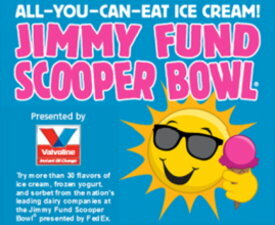 The Jimmy Fund Scooper Bowl started in 1983 with only four ice cream vendors. Originally known simply as the "ice cream fundraising event," this fete has grown into the world's largest all-you-eat ice cream festival. The Scooper Bowl is now a 3-day event featuring some of the best ice cream producers in the country. Tons of ice cream are dished out to over 50,000 ice cream fans. To date, the Scooper Bowl has raised more than $6.7 million over the last 36 years for the Dana-Farber Cancer Institute, a world-renowned cancer research and patient care organization. Admission is $8 for adults and $3 for children aged 3-9. Advanced online ticket prices are discounted. A three-day Scooper Pass is $20 if purchased online. A rain or shine event. Held at Boston City Hall Plaza from 12:00 pm to 8:00 pm, ice cream vendors from all over the country combine efforts and stop being competitors for this event. They donate the ice cream, scoopers, personnel and other resources needed to make what is known as the "unofficial start of summer" happen in Boston. Aside from just serving ice cream, the Scooper Bowl has really into a full-blown celebration or festival of sorts. It features entertainment and fun for the whole family. Even if you aren't an ice cream addict, there are still many things worth while at Boston City Hall Plaza when the Scooper Bowl is going on. You can expect many different and diverse flavors of ice cream, gelato and frozen yogurt at the Scooper Bowl. There is even a Text-Your-Favorite-Flavor Contest to determine which among the choices from all of the sponsors and ice cream manufacturers to determine the favorite among the crowds. To give you a sneak peek, some of the top winners at previous Scooper Bowls include Ciao Bella Gelato's Mango Sorbet, SoCo Creamery's Dirty Chocolate, Ben & Jerry's Late Night Snack, Edy's Espresso Chip, and Friendly's Hunka Chunka PB Fudge. Imagine an all-you-can-eat feast for all of these sumptuous flavors during a bright sunny day! For entertainment, there are multiple musical performances per day. They feature the best of local Boston talent coming from different genres of music. Some notable performances from previous festivals include Zili Misik, Friends of Broadway, and the Jackson Weatherbee Band. It's definitely a great experience to be slurping tons of ice cream, enjoying great entertainment, and knowing you're giving back to the community by supporting the Dana-Farber Cancer Research Institute. Anyone, whether young or old, would definitely have a "sweet" time at the Scooper Bowl. The Dana-Farber Cancer Research Institute was founded in 1947 and has been providing adults and children with the best treatment available today for cancer. They are also working on tomorrow's cures through cutting-edge research. It's a multi-award winning organization, with members of its staff the recipients of numerous industry awards for excellence in their fields. Dana Farber's Jimmy Fund finances research to help find cures for cancer in children.